DNA pieces complexed with proteins to form chromosomes. The diploid human genome, therefore, is contained in 46 chromosomes: two of each of the 22 autosomal chromosomes, plus either two X chromosomes, in females, or one X and one Y chromosome, in males. Since the length of each helical turn of a double-stranded DNA molecule is 3.4 nm, consisting of ten bases, the length of the total genomic DNA in each cell measures approximately 1m in length. For each cell to contain this long molecule, the double-stranded DNA must be compressed. A complex of eight basic histones (two copies of histone 2 [H2], H3, H4, and H5) package the DNA.9 The histone complex contains positively charged amino acids that bind to 146 bases of negatively charged DNA. Histones fold the DNA either partially or tightly, resulting in compression of the DNA strand. Tight folding of the DNA condenses the DNA into heterochromatin. Following packaging and condensation, the nucleic acid strand widens from 2nm to 1400 nm, with extensive overall shortening of the nucleic acid in the metaphase chromosome. Light microscopy easily permits the visualization of condensed metaphase chromosomes. Less-condensed DNA binds histone 1 (H1) proteins or other sequence-specific DNA-binding molecules. Some of these DNA-binding molecules regulate gene expression (discussed later in this chapter). In contrast, tightly condensed chromosomes lack the "open spaces" for binding of regulatory proteins and prevent gene expression from tightly condensed DNA regions. These proteins may also prevent access to nucleic acid probes or primers for molecular diagnostic tests. As a result, many DNA extraction protocols include a protein-digestion step to liberate the DNA from these DNA-binding proteins. Removal of these proteins facilitates hybridization with short pieces of nucleic acid, such as primers or probes. two new nucleic acid strands that are complementary to and base paired with each of the original two template or parent DNA strands. This replication process is known as semiconservative because each resulting double-stranded DNA molecule consists of one new and one old DNA strand (Figure 1-3). Polymerases function to synthesize new nucleic acid molecules from nucleotide building blocks. The sequence of the new strand is based on the sequence of an existing nucleic acid molecule, and the polymerase adds nucleotides according to the order of the bases of the parent strand, using G : C and A : T pairing. The new strand is antiparallel to the parent strand and is synthesized in a 5' to 3' direction. Of the two parent strands of genomic DNA, one strand (called the leading strand) can be read by the polymerase continuously in a 3' to 5' direction, with the new strand generated in a continuous 5' to 3' direction. In contrast, the opposite strand (known as the lagging strand) cannot be read continuously by the polymerase. The replication fork moves along the lagging strand in a 5' to 3' direction, and polymerases synthesize only by reading the parent strand in a 3' to 5' direction while synthesizing the new strand in a 5' to 3' direction. 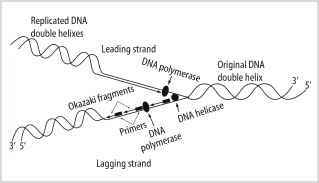 Therefore, synthesis cannot proceed continuously along the lagging strand, which must be copied in short stretches primed from RNA primers and forming short DNA fragments known as Okazaki fragments. The new strand complementary to the lagging strand is formed by removal of the RNA primer regions and ligation of the short DNA fragments into a continuous daughter strand complementary to the lagging strand. Discontinuous 3' to 5' replication results in the progressive loss of ends of the chromosomes known as telomeres in normal cells. Some malignant cells retain telomerase activity that permits the addition of these terminal telomeric sequences to the chromosomes. While replication requires many proteins, the poly-merase determines the speed and accuracy of new strand synthesis. The rate that the four nucleotides are polymerized into a nucleic acid chain defines the processivity of the enzyme. The processivity of most polymerases approximates 1000 bases per minute. The fidelity of the polymerase refers to the accuracy of the enzyme to incorporate the correct complementary bases in the newly synthesized DNA. Incorporation of incorrect bases or other replication errors can result in cell death or oncogenesis. The error rate of polymerases varies widely from 1 in 1200 to 1 in 1,000,000 bases (Table 1-4). To correct the erroneous incorporation of bases or other replication errors, protein complexes proofread and correct synthesis errors. In normal cells, the cell cycle pauses to facilitate error repair in the G2 phase of the cell cycle (Figure 1-4). Malignant cells may not pause to allow for error correction, resulting in the accumulation of damaged or mutated DNA. 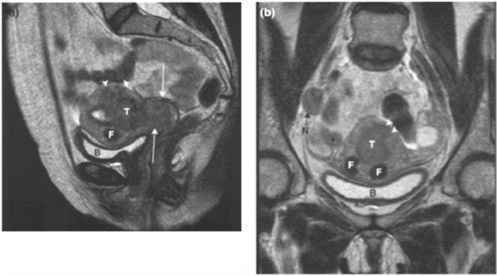 Figure 1-4. Cell cycle. 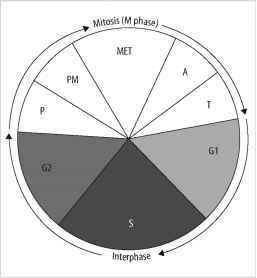 The clear panels are the ordered phases of mitosis (M phase), while the gray and black panels are the ordered stages of interphase. P, prophase; PM, prometaphase; MET, metaphase; A,anaphase; T,telophase; G1,gap 1; S, DNA synthesis; G2, gap 2.
replication (Ori). These multiple sites grow progressively until the newly generated strands join to form complete chromosomal-length DNA.